if I open http://jalbum.net/maps/downloads.jsp I get an error message, see enclosed screenshot. Oh.... Thanks for the report! I did check that page only a few days ago, so it must be very recently Google changed that. And I thought old Google Maps would work forever. But I guess I was wrong... I'll fix it during next week. My own "old API key" freebies are still working. Who knows what Google is up to? Or did the jAlbum map page get a lot of traffic? Can't imagine that's the case. Or did the jAlbum map page get a lot of traffic? Can't imagine that's the case. The map is now back in working conditions. I doubt whether this is realy working: I downloaded jAlbum 17, but there is no activity voor the town Almelo in the Netherlands! Your IP is mapped to the city "Goor" in our geo database. Maybe we got an old database. Also Goor shows no activity. 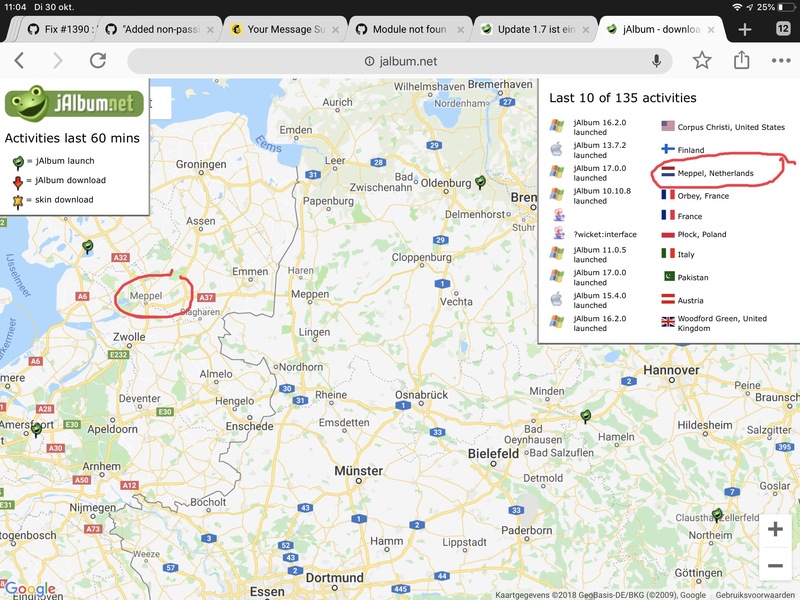 In fact shows whole East-North Netherlands no activity! Btw what is an ?wicket:interface activity? There is (more or less exactly) a one minute delay between the event and when it shows up, so you can test it. The wicket-thingy is a flaw introduced when we made some changes to the download mechanism.